I've known about Gurian guitars for a decade. Living in Vermont, and considering that Gurians were built for more than a decade in nearby New Hampshire, I've seen perhaps a dozen in the hands of players. One friend, Spencer Lewis, has recorded six albums using his J3R model bought new in the early 1970s from the factory, located then in Hinsdale, NH. In 1994 I purchased used my Gurian, Model 3 H JR C2216 which was built around 1975-76? in Hinsdale, NH. This guitar has a Spruce top, Indian Rosewood sides, 3 piece back, with mahogany neck and ebony fret board and gold Schaller tuning machines. When I bought it in 1992 it was the best sounding guitar I had owned. Gurians were never built in large numbers, perhaps a few thousand from the late 1960s until the company's demise in 1981. They are now being sought after as excellent playing instruments. Their value is rising. This web page will present the history of the company, describe the models, and give starting points for serial numbers to date instruments. Bob Thomas lives in England. In 1978 while a member of the Scottish group Silly Wizard he bought his first Gurian in Edinburgh. Since then he has amassed perhaps the largest collection of Gurians in all of Britain perhaps the largest collection on the planet!!! This photo depicts the following models: S2M, S3R, JRH. What got you started building instruments? "I needed a guitar. I had a good classical guitar and was teaching classical guitar, and I needed a secondary one for teaching. I basically copied my good guitar, and the one I built I like better. I like working with my hands, so one thing led to another. Most of the techniques I learned were developed upon traditional techniques, pretty much unlike what's goin on today. Today everyone needs the table saws, the bandsaws, every kind of power equipment under the sun. But I could go out and be a gypsy, head out with a little valise, and in that valise I would have all the tools and woods necessary fro three guitars. A couple planes, some good chisels, some rope..."
"That's all! And its the same thing with the lutes and everything else. In my shop on Carmine Street in New York I built 175 classical guitars just like that, and 75 lutes as well. Did very well by it, without any of the fancy machines and equipment. I got to a point where I never made mistakes on the instruments, and I truly believed I could build the instruments blind. It became automatic, and then so boring that I just didn't want to do it anymore. The conceptualization and the sound were all that still interested me at that point." And you achieved the sound you wanted? For the most part, yes. For the most part I nailed it right on the mark, although it took quite a few years to reach that level. Most of my techniques I eventually developed from a lot of inspection, a lot of visits to museums, a lot of time in the library, and visiting shops around the world. The first few years it was mainly ego and BS, but after a while I realized, oh man, I really can do this!" "It still exists. My cousin in Seattle has it, and it still sounds great. It's a little crude, but it has stayed together and it's over thirty years old. That thing went together with bricks and rubber bands. This was back when I was in college. I had a little studio, and I'd wake up in the morning and shake the dust off of me, the sawdust would settle overnight." "Michael Gurian is an extraordinarily gifted guitar maker, best known for his New Hampshire-based workshops of the '60s, '70s, and early '80s. Today he manufactures and supplies guitar fittings, marquetry, and tools; imports wood; and acts as a consultant to the guitar and woodworking industry. "During the early and mid-'60s, Gurian learned from luthiers Gene Clark, David Rubio, and Manuel Velazquez. He mastered the craft of classic guitar making and became a talented lutenist, lute maker, and builder of the Armenian oud. One of his early shops was on Carmine Street in New York City, where he built classic guitars and lutes for many of the top recitalists of the 1960s. He later opened a shop on Grand Street and then moved it to Hinsdale, New Hampshire, in the early '70s. His operation was one of the first significant forerunner to many current American ateliers, including those of Mossman, Santa Cruz, and Collings. "Gurian built his reputation among studio guitarists who liked fast, narrow necks and the punch of a long scale length (his was the longest in the business). Some of the celebrities who play Gurians are Jackson Browne, Bob Dylan, Joan Baez, and Paul Simon, who still treasures a custom wide-neck Size 3 Gurian made for him in the early '70s. Dogged by bad luck, a disastrous fire, and a major recession, Gurian Guitars, Ltd., closed up shop in West Swanzey, New Hampshire, during the '80s. "Only a couple of thousand Gurians were ever made, and everyone I know who owns one is very possessive of it. As a result, Gurian guitars are very scarce on the market today. I would consider any Gurian in good condition an excellent purchase." Woods Used--Honduras Mahogany, Indian Rosewood, Brazilian Rosewood, Koa, Maple binding, Ebony fingerboards, Schaller machine heads, Ivory saddles and nuts (when available!) FRAP GF100 3- dimensional transducer available for Cutaways. The Fraps were installed in 1980s and 81 according to the 1981 catalog. Back in 1981 they cost $960 for the CM, $1295 for the CMPH and $1460 for the CRH models. Distinctive Features: Jumbo was exceptionally deep bodied--5 inches at the tailblock. 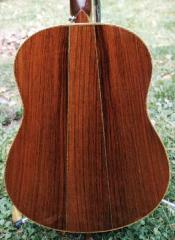 Many A-series Brazilian Rosewood models were made. The necks were integral with the sides (Spanish construction). The truss rod was a single imbedded rod. Top purfling was full (double) herringbone. Distinctive Features: Separate neck held to body with wooden taper pins.G decal appears on headstock. Top purfling was "white line" half-herringbone. Mahogany and East Indian soundboxes, with only some Brazilian Rosewood/German Spruce models were made. Models Available: Size 2, Size 3 and Jumbo. Three cutaway guitars were made. Curly Maple available. Mahogany and Indian Rosewood common, but very few Brazilian Rosewood guitars made. Distinctive Features: Double ("over and under") truss rod wrapped in aluminum tape introduced. Models Available: Size 2, Size 3, Jumbo and Cutaway. Two of fanciest models (Brazilian Rosewood J3R3H--Jumbo three-piece back rosewood/herringbone with Englemann spruce tops) were made, one was stolen. One prototype Gurian 12-string made. When Was My Guitar Made? To start you would look for the series letter A-D. Obviously an A series is older than a D series instrument. 52K D1615 size 2 1980? S2K D2300 1984 purchased new. I have an S3R/B1383. Purchased this from Michael in the early 70's. Recently had it refretted by Don Alfieri on Long Island. The tone is magnificant. I have it strung with Martin 80/20 extra light strings - 10/47. Larry Lewitt. I'm thrilled that somebody's doing this! I bought my Gurian almost two years ago now, and I love it to death. It's a conversation piece just about everywhere I go - one time, somebody in the back of the room stood up at an open mike I was playing and shouted "Hey! That's a Gurian!". I bought mine at Mr. Music in Allston, MA; it was one of two Gurians hanging on the wall, and I tried every single guitar but those two, and my girlfriend said, "What about that one? It sort of looks like your old one." Picked it up, never looked back. The primary things which attracted me were the unusual shape of the body (the top is rounded in a way that most guitars are not) and the flamenco length neck. Also, looking at your page, it seems that the body of my guitar is mostly rosewood, and my old guitar is solid rosewood, so that all probably explains the initial attraction. I've got three Gurians, a JM (D1883), an S2R (D1315) and an S2M (C2536). I've noticed some differences and am trying to figure out what was probably original and what may have been owner changes. The most puzzling is that the S2M has Schaller mini tuners and the S2R has the fullsized Schallers. There's never been much cost savings in minis, so this seems strange. My serial number is J-M C1456, which makes it mid-70s. Somebody's beaten the hell out of it; it's got belt buckle scratches on the back, and the face has a crack which runs up the center seam, above the sound hole, and into the ivory fretboard, believe it or not. Paid $700 for it. It has a light face, which I know isn't rosewood; is that maple? Perhaps you can tell me. According to your measurements, it looks like mine is a jumbo, although it doesn't seem quite to be as big as the measurements you have; for instance, the maximum depth, measured across the bottom of the guitar, is 4.675", and while the widths match up pretty well, the body length is closer to 19.75". Ronald A Aguiar writes. I have a JM that I bought new in '73 and still love it the only problem is that Michael experimented so much with finishes that to this day even the very best luthiers I have taken this instrument to cannot tell what the finish is, best guess is some sort of bastardized french polish or modified nitrocellulose, and believe me some VERY good finish folks have looked at it. The story is this: I had Sam Ash in Manhatten put this one a Blonde Guild F50 and Martin D35 aside while I made up my mind and every day for a couple of hours I would go and play the trio, the gurian was toughest to play, not set up as well as the others, but that tone !!!!! I had to have it. Next time I saw one Jackson Browne was playing one at Red Rocks in 1977, new it was cool. Monty Novotny of NBN and Novotney Guitars loved it back in the late 70's before he died. Master Luthier Scott Lofquist has it finally set up for the best sound I've ever heard. They sing. Peace. Thanks for the nice page. I stumbled into owning a Gurian 7 years ago. I had owned a beat up Yahama for 20 years. I had decided to play every guitar in southeastern Michigan and select one that was the perfect balance of price, sound and playability. The first place I looked was the Pick 'n' Strum Shop north of Detroit, run by Earl Gormaine, an older gentleman known as quite a guitarist in his day. The store was/is decrepit, shaped like a boxcar, with ancient instruments hanging off the walls and a one-eyed ancient dog. There is one aisle barely wide enough for two persons to pass. It's open 3 hours a day 3 days a week. The roof leaks when it rains. I told Earl I had played a Gibson J50 and thought I might want one. He had a different model that he hauled out from a pile of guitar cases. $1,000, without the case. He left me alone for about 20 minutes and returned to criticize (accurately) my playing. I said, yeah, OK, and do you think I might be able to look at a SECOND guitar? He dragged out a Martin Shenandoah that played great but was a little buzzy. $850, no case. There was so little room I had to put one guitar back in the case before pulling the other out for comparison. After another 25 minutes I knew that neither one was really what I was looking for. He watched me a little longer (fingerpicking) and said, I think I have a guitar you might like. He wandered off and returned with what struck me as a sort-of-funny-looking guitar. After playing for about 30 seconds, the hair on the back of my neck started to rise. Great sustain, very playable, beautiful, BEAUTIFUL sound. I had never heard of a Gurian. Earl said they don't make 'em any more; factory burned down. I didn't see a truss rod; might the neck warp? Well, Earl said, if that neck was going to warp it would have warped by now. The more I compared the more excited I got. I said, I think I like this better than either of the other ones. Lucky for you, he said, it costs half as much. $550, including the case. I was torn. How could I buy the 3rd guitar I looked at? I had 500 more guitars to play. And what about the neck? But I couldn't resist. but I asked myself, what if I went and played those 500 guitars and decided to come back, and it was gone. I was afraid to make a quick decision but the prospect of missing out on such a wonderful instrument overcame my reluctance. I put down $50 and told him I would come back with the rest the next day. I took it home. Every time I picked it up it made me giddy. I called Earl back a few days later and told him I was the guy who had bought the Gurian. I think he was expecting me to want out of the deal. Yeah? he growled. I said, I just wanted to tell you that that guitar makes me happy every time I pick it up. Oh, he said, good for you. It still does. Buying that guitar is the one, unequivocally perfect decision I have ever made. It's great to know that lots of people feel the same way I do about their Gurian(s). Mahogany neck, sides, back; Rosewood bridge; ebony fingerboard; spruce top; herringbone around sound hole; half herringbone around maple (or rosewood?) binding. I own a Koa S2K D2300 with gold Schaller tuners and ebony fingerboard. The guitar is in excellent shape except for a few minor finish cracks on the top. The Gurian emblem is different. The gold G is there, but Gurian is written over the top at a slant, begining from bottom and slanting upwards. Also, inside the guitar is a sticker in brown and white which says Gurian Workshops. Earth, third planet from the Sun. From Bob Thomas formerly of Silly Wizard. "I recall seeing a CMH in Edinburgh when I bought my S3 that had a factory installed FRAP pickup and preamplifier. The pickup was under/behind the bridge, the preamp (large pcb) was mounted on the back under the soundhole and the battery holder was on the end block. There was a volume control mounted through the treble end of the bridge which had a small, custom brass knob fitted to it. I've seen one other Gurian (JR) with this fitted in the past. As I recall it was a good sounding set up though the knob got in my way"
" In Edinburgh in 1978 my S3 cost £525 (probably then around $1500) and the JRH cost £675 probably around $1900. " "I own a Gurian JM D2172 which I bought in 1981 at a Nashua, NH music store for about $350. It was supposedly a "second," whatever that means. It has always played easily and seems to sound better when someone other than myself is playing it. (sigh) I've kept light guage strings on it but have recently have switched mediums tuned a step lower. It sounds much richer than before. I'm lucky to own one and will surely treasure it as long as I have fingers. I hope to pass it on to my son someday." "I've owned my Gurian JR (jumbo rosewood; serial no. C2059) for over 20 years now and I still love it. I purchased it new around May of 1976 at "Music Strings N' Things" in Birmingham Michigan for $517 (what a bargain by today's standards). The guitar was probably built early in 1976 or late 1975. My JR has Indian rosewood back and sides, Sitka spruce top, Honduras mahogany neck, ebony fingerboard, Brazilian rosewood bridge and peghead veneer with half-herringbone purfling and maple binding. I've always been impressed with the wood quality, clarity, resonance, and balance of Gurian guitars which are especially suited for fingerpicking. My guitar has held up very well over the years although the once "incredible" low action is now merely "very good". Some of the unique feature of Gurian guitars such as the truss rod and glueless ebony-pinned neck/headblock joint are discussed in W. Cumpiano's and D. Natelson's excellent book "Guitarmaking, Tradition and Technology". I've been looking to buy a rosewood/cutaway acoustic for a bout a year. Looked at all the usual suspects. I LOVED some Collings and Santa Cruz models but couldn't cough up the $2500-3000 entry fee. Also, I wanted something closer to an Auditorium sized box--I knew I didn't want a dreadnaught. Well I found a cool Gurian (the only one I'd ever seen). Fell in love. They wanted $1300 but we put together a package which included some trade bait and some cash and took it home. Cuddled it all night. Couldn't sleep so I got up at five am just to noodle it some more. BTW...mine's a rosewood cutaway with mahogany neck, ebony fretboard and rosewood binding. Beautiful herringbone on the front, back & sides. About a 1980 model. I got my Gurian Cutaway from Woodsy's Music in Kent, Ohio. It is a Model CRH and serial number D2391. The dealer said "CRH" stands for cutaway, rosewood and herringbone. This guitar features rosewood back and sides, rosewood bridge, spruce top, mahogany neck and gold Schaller tuners. The fretboard is ebony and has no inlays. A very distinctive feature of this guitar is the rosewood binding and delicate herringbone that appears on the front, sides and back of the body. A gold and black decal on the headstock says "Gurian" and is obviously a different design than that which appears in the photo on your web page. The headstock has a thin rosewood veneer. The owner's portion of the warranty card is still in the case and states that the guitar is "waranteed" for life to the original purchaser. The handwritten date on the card is 3-28-83. The owner of Woodsy's Music said he sold numerous Gurians during the 70's and said that this was one of the most expensive models. I've been playing Gurian's for about 20 years - ever since I met Michael Tobias, who had a Gurian Size 3 Maple Cutaway in his shop, and had dinner with Josh White, Jr., who was the first person I knew to perform with a Gurian (his was a jumbo). Michael ordered my guitar from Gurian while I was in Florida and received it just after I arrived in Idaho. I recall him taunting me with it as we talked on the phone. He'd play, remarking "This is the finest Gurian I've ever experienced...", while I sat in nervous anticipation. An absolutely wonderful instrument. It still houses a F.R.A.P. GP-100 transducer and preamp which has proven one of the absolute best systems around for years. Plug it into a P.A. and you're transformed to a place that sonically resembles the inside of a guitar cathedral. Six string heaven. My mahogany cutaway paled in the shadow of the jumbo for years until Larry Robinson agreed to inlay the headstock with his interpretation of a nautilus shell. It's shape and alignment provide a subtle complement to the shape of the guitar. This guitar turned out to be my travel guitar, featured at several shows I did on Maui a couple of years ago. It handled the changes in climate and humididy very well - or should I say it just ignored the changes. A most excellent, stable instrument. The third guitar is a rosewood Size 3 that I bought from William Cumpiano just a couple of years ago. It shows the signs of a _lot_ of play - scars on its neck, top, and back - but it is a wonderful player. With a recent neck reset and refret, it is the standard to which I refer when people ask the "What's the best guitar for under $1000?" The answer will always be "An excellent used guitar". And if you're lucky, as Gary was, maybe you'll find a Gurian. I was pleased to find your page. It took me back twenty years. I bought a new Gurian S2R in the late seventies and liked it very much but, for better or worse, traded it away and I still sort of miss it. A friend in Maryland had a Gurian jumbo and I resolved to get one of the smaller sizes. There were no dealers selling them in my area so I ordered one through a national dealer. At a time when most new guitars lacked the "hand-made" feeling and were primarily bound with plastic, etc., the Gurian was really special with its wood bindings and unique shape. It wasn't the perfect instrument for me in that I prefer a somewhat shorter scale and wider neck but it was a really nice guitar. When I sent in my warranty card, Gurian sent me back a catalog which listed the three main steel-string sizes and compared them as well as listing information on which strings would be appropriate (light for 2 and 3 and medium for the jumbo). The catalog included info about woods and construction techniques. It also pictures a cutaway which appears to be maple and offers it with or without electronics. It states that the cutaway model is a Size 3. 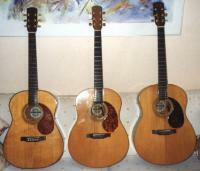 Three models of classic guitars are listed as is a flamenco model. There is an accessory page for polish, strings and a kit to make a "dixieharp"! Curiously enough, I still have the catalog although I no longer have the guitar! By the way, the Size 2 was approximately a "00" size but, if I remember correctly, it was a little deeper. Thanks for the page on Gurians even if it did make me regret that I no longer have that S2R. Art - I love your page. It is about time someone devoted some space to these excellent guitars. I own a Gurian Jumbo #D1929 which makes this guitar a 1981. It is a large body guitar very much like the one you are selling except the back is two piece. (Rosewood and spruce). I own many acoustics but this is one of the best sounding. Years ago, I owned a maple bodied cutaway done in herrigbone purfling everywhere. Unfortunately, I sold it. I would love to get another. Maybe someone will post one on your site! Anyway, thanks for the informative site. If I ever decide to sell my small beauty. It's in brand new shape, bought by me @ Terminal Music W48th St NYC. S/N S3M C3250. Must have been by your standards 1981 or so, It is un-jumbo yet has a nice presence. If you hit a G on the bass string it buzzes a little. I have a Gurian Classical that's about 20 years old that I would like to sell. The Numbers and letters on the inside of the guitar are: CLR D2370. For most of the seventies I worked for Woodcraft Supply. We supplied many of the luthiers with their tools and collaborated with some of them in the design or distribution of new ones. I had heard about the Gurian factory in Hinsdale and decided to visit. It was a strange day. When I arrived at the factory, an old New England gray wooden structure, there was an unearthly silence. The place seemed curiously empty. I wandered around a bit and found Michael. His face was ashen. It seemed that only a few hours before the big bandsaw had snapped sending the broken, loose end flying through the air and lodging it into a nearby log. Six feet or so from the bandsaw operator. Scaring the hell out of him and sending the workers home for the day. We wandered around but clearly Michael was not up for a visit. Preocccupied. He did take me home with him though. Coffee, pool, and flamed maple is what I remember of the visit. It seems that on his wood buying and consulting trips to south America he also brought home select coffee beans to grind in his '50s-style coffee shop grinder. We sipped some of this industrial-strength stuff and shot pool - he had a table in the living room. One of the highlights of the trip involved a walk in the woods to visit a massive curly maple tree on property I believe was his neighbors. This mythical tree was one I believe he had guitar plans for. We climbed around it and wondered at its age. He was pretty upbeat during the visit. It wasn't long after that the shop burned down and he moved on to West Swanzey. When I visited that shop it was so different. Really a factory in a big corrugated box. The sawmill was in another building. There was chaos there and the vibe was very tense. There were money problems and they had over-extended in the building of this factory. I guess sales were not supporting the debt. As a representative of Woodcraft I was asked if we were interested in investing in the business. We passed. I wanted to get involved but couldn't sell the idea. I did see an interesting new cutaway flamed maple guitar on that visit that he had started to make and a gunstock carving machine that was being used to carve necks. He was proud of that new find. I guess that the maple that I had seen in the standing tree ended up in guitars - but not for very long. They were out of business shortly after. Andy Cyr writes: I have a Gurian guitar. Serial # 52K D1615. It is possibly a size 2 as it's dimensions do not match ones listed on your home page. It is 40 ins long. Max depth is 4", Body length is 19", upper bout 11.6", lower is 14.7" waist 10.125". It has been a good Guitar over the years. I got it around 1980, and although I do not play well or much, have enjoyed having it around. Just wanted to say how much I have enjoyed your Gurian guitar page and pass on a true "it's a small world" story. Last December I purchased a wonderful Gurian from a nice fellow here in Seattle who owned both a size 2 rosewood and a jumbo rosewood. He sold me the small body and kept the jumbo. My guitar is an S2R model with a three-piece back, Indian rosewood, gold Schallers, herringbone trim and maple binding. The serial number is D-1177, making it a post-fire production from 1980-81. Its a real beauty (except for some belt buckle scratches) and has opened nicely. This page was designed by Art Edelstein and first posted September 11, 1997. It is hosted by Guitar Notes.